Most likely you are on IH-35. You might be coming down US 183, in which case please see our directions from the west. If you are on IH-35, you will take exit 238 for Koenig Lane. IH-35 has three lanes going into Austin, then picks up a 4th on the right just before US 183, and a 5th lane on the right after 183. 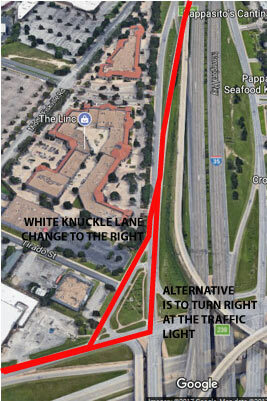 You’ll want to be in that 5th lane over, as it peels off to exit onto US 290/Koenig Lane. Keep right to take Koenig west. You will need to get right quickly on the feeder road once you hit the ground. Once you get right, you can make a right at the intersection. You can also take a cut through on Brooks Lane, unmarked save for a sign indicating RM 2222. Turn right since that is all you can do. Either way, you’ll make that right turn onto Koenig. You will pass through the light at Airport Blvd (right two lanes). You will go over the railroad tracks, through the light at Avenue F, and then turn left on Guadalupe. As soon as you are on Guadalupe, make an immediate right into 5555 N. Lamar, or if necessary your second right. If you make your third right you’ll run into our friends at Monkey Wrench Bikes, who will gladly give you directions. If you like to get turn-by-turn directions, click on the map at the top of this page to go to Google Maps. Expand the Side Panel (if necessary) and click “Directions” Put in your starting location and our location. Google Maps will recognize our GPS location, 30.3236N 97.72555W, and will route you through the business park to our door.